Risotto is so quick and easy in the thermomix that it has become my fall back meal when all other plans disintegrate around my ears. Or when I’m feeling extremely lazy. This little beastie was inspired by a poorly stocked fridge, a late afternoon arrival home from a weekend away and the flavours of colconnon. 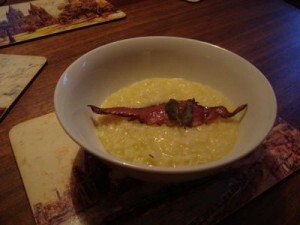 Well my version anyway which incorporates bacon. 1. Place parmesan in thermomix and grate for about 7 seconds on speed 7. Remove and set aside. 3. Add the rice and cook for 2 minutes at 100 degrees on reverse speed 1. 4. Add wine and cook for 2 minutes at 100 degrees on reverse speed 1. 5. Addd stock and cabbage and cook for 15 minutes at 100 degrees on reverse speed 1. 6. Stir in half the parmesan, dollop of cream and remaining butter. Season to taste. 7. Serve and top with prosciutto and sage leaves. 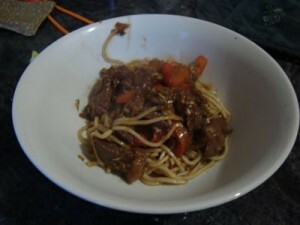 In an otherwise low news week here at chez KP, First Born made a beef and veg stir fry this week. 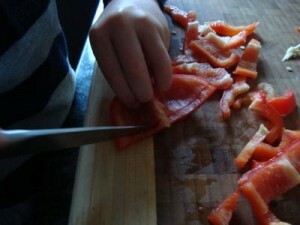 Slicing the rump steak defeated him and he is struggling to master his knife skills but remains undaunted.